This individual Report The US Small Business Credit Card Market is available for purchase. This Report is available to members of Mercator Advisory Group’s Credit Advisory Service. Please be advised that this Report is normally part of a research and advisory service that provides ongoing support throughout the year. As such, this Report contains significant depth of content that is selected for its strategic importance to our members. (For a description of these services, see our Advisory Services section). As the growth in general purpose card volume started to slow down in the 1990s, credit card issuers turned their attention to new categories, including debit and commercial cards in an effort to sustain growth. In the commercial card market there was rapid growth in the purchasing and corporate card segments in the early to mid 90s. While in recent years, small business cards have taken the lead. Overall, the year-over-year segment growth rate was more than 20% every year over the 1998-2003 period. 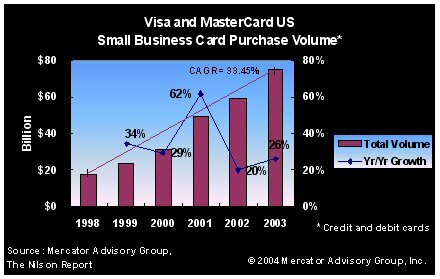 In 2001, Visa and MasterCard small business card purchase volume alone grew at a rate of 62%. Meanwhile, small business credit card outstanding receivables were up by 34.5 percent from $7.9 billion in 2000 to $10.7 billion in 2001. The segment continues to grow at double-digit rates driven by the growth in small business debit purchase volume. Evren Bayri, Director of Mercator Advisory Group's Credit Advisory Service comments, "The small business credit card segment has been a major driver of growth for the U.S. commercial card category as well as the total credit card volume category. The future volume growth can be generated through converting small business check payments into plastic. Automated bill payment, professional services, health care, and telecommunications are some of the categories where the conversion can create significant charge volumes." This report examines the U.S. small business credit card market looking at the characteristics of small business including the financial trends in the segment. It provides historical and current information on the U.S. small business credit market, and lays out the competitive landscape focusing on the top four U.S. small business credit card issuers. The report contains 26 pages and 21 exhibits.